Those look very nice. I like your horse colours- very natural looking. 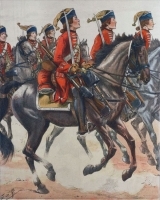 Just a remark, unlike for cavalry regiments in the Corps des Carabiniers rifled muskets were carried as dragoons rifles, stock down in a leather case. And during the Polish succession war, in 1734 they were equipped with a bayonet. Last detail, as they do horse and foot services, they wore boots as Mousquetaires with low shoe upper part (chaussures à tiges basses). 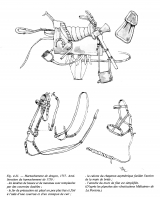 Please forgive, I was working from the (rather sketchy) information in the Osprey Louis XIV book; was holster for the musket a shallow "boot" style or a deeper version? I would greatly appreciate a picture reference if you could provide one so that I can correct the models. Also I am looking at a much earlier period 1690-1714, does impact the boots and holster arrangement? It was probably a shallow boot as for dragoons.